LES THÉÂTRES AU MOIS D’AOÛT. English: A QUEUE AT THE THEATRE. - They are dreaming of a packed house and of selling lots of programs and extra folding chairs.... let’s not wake them up! 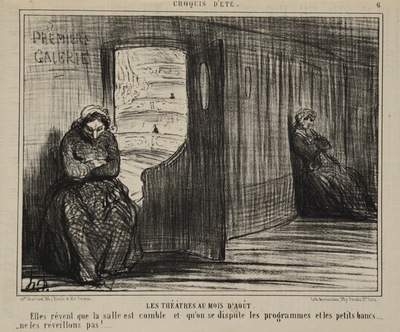 Daumier’s print addresses a serious problem that affected many in the theater world. During the summer, few Parisians were interested in going to plays or other performances. Small theaters, which were not subsidized by the government, often experienced severe financial setbacks.